Hours before the Poseidon tests were screened by Russian state television for the first time in late February, Russian defence chief Sergei Shoigu announced their completion. A top-notch underwater drone armed with a nuclear warhead, Poseidon, is scheduled to join Russia’s arsenal no earlier than 2027, people close to US intelligence told CNBC, citing their assessment. "What we are basically dealing with is a Russian submarine, that is difficult to detect, launching a drone, that is difficult to target, equipped with a nuclear warhead", one person said on condition of anonymity, adding that the Russians are determined to use the advanced nuclear-powered vehicle “as a retaliation device if their legacy nuclear weapon launch capability is neutralized during war". According to CNBC, Russia has yet to effectively test the vehicle’s nuclear propulsion heart, which is key to its overwhelming power. However, Russian Defence Minister Sergei Shoigu said in February that the Poseidon sea tests had been successfully completed. They were carried out in an offshore zone that was well protected from a potential enemy’s intelligence forces. 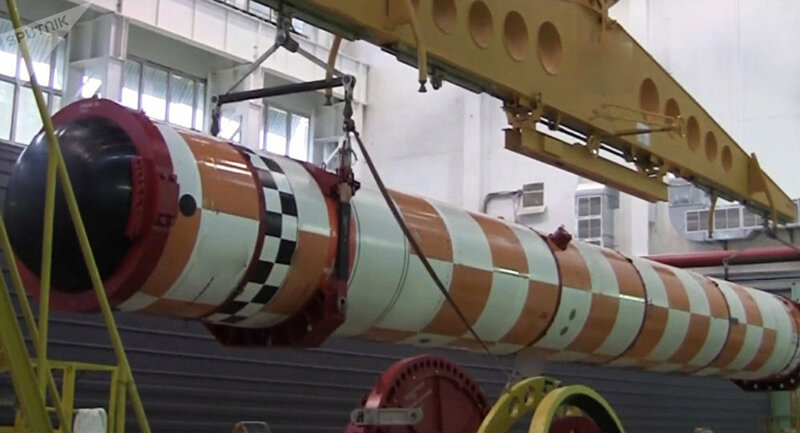 The tests of the system’s nuclear warhead, finalized back in 2018 and shown on Russian television for the first time this February, proved its incredible capacity. The fact that tests have already been completed casts doubt on the credibility of CNBC’s report and the cited sources. Deputy head of Russian State Duma’s defence department, Yuri Shvitkin, commented on the US edition’s article in an interview with RT, saying Poseidon drones will become part of the Russian arsenal much earlier than 2027. “I'll let down the US and tell them that the Poseidon system will become operational much earlier than they predict. It has mostly to do with their aggressive policies with regard to our country. American politicians openly dub Russia bellicose, and we have no time to equip the armed forces only by 2027, ” the MP noted, adding that the measures are purely defensive. “This will just be a sobering and deterrent factor for some hotheads,” Shvitkin stressed. Russian media previously reported that the Russian Navy is set to place some 30 Poseidon drones on active combat duty, while the US Navy cannot boast a similar weapon to date, CNBC noted. The special-purpose nuclear-powered submarine Khabarovsk currently being built at the Sevmash Shipyard is said to become one of the carriers of the Poseidon nuclear-capable underwater drone, along with Project 949A nuclear-powered underwater cruisers operational in the Russian Navy. The underwater drone is one of the six weapons President Putin proudly talked about during his national address last March as systems designed to guarantee a Russian response and the country’s security in the event of an enemy’s nuclear attack. CNBC reported that two of them are being readied for full operational capability by 2020. The first one is the hypersonic glide vehicle known as Avangard, which is designed to sit on the top of an intercontinental ballistic missile and the testing of which began as early as 2013. The Zvezda TV channel, the official media outlet of the Russian Defence Ministry, published a video of the test launch of the hypersonic missile Avangard, depicting it from the launch command centre, late last year. The other one is the Kinzhal, Russian for “dagger”, a new Russian air-launched manoeuvrable hypersonic cruise missile, which was tested aboard the Tupolev Tu-22M3 strategic bomber, as was confirmed by the Russian Defence Ministry in early August 2018. The missile has already been deployed, and has undergone extensive flight testing on board the MiG-31BM supersonic interceptor aircraft, which can carry a single Kinzhal.